The bicyclepasta tricolore from Holcus is a unique product sold in only a few European countries. It is made by the family owned company Pasta Röthlin AG, which has its seat in the picturesque village Kerns in Switzerland. This small town is close to Sarnen, 25 kilometers south of Luzern, and surrounded by impressive snowcapped mountains rising up more than 3000 meter. The for cyclists well known and popular Susten, Grimsel and Furka Mountainpasses are on a distance less than 50 kilometers as the crow flies. In Italy bicyclepasta is sold by the name Bicicletta tricolore, in Switserland by the name Velo tricolore and in the Netherlands and Belgium by the name Fietsjespasta. De red color in bicyclepasta tricolore is made with tomatoes, the green color is caused by spinach and the white yellow color is the pure natural form without any colouring. Outside the Netherlands and Belgium Holcus has no means of distribution other than sending by post. Unfortunately this is rather expensive. 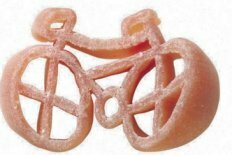 Bicyclepasta is sold in packets of 500 grams. The price of this unique quality product is 3,50 euro a packet. If you wish larger quantities it is also obtaineble in boxes of 10 kilograms (prices on request). For the costs of postage, see below. If you any question or want more information about this unique product you can contact Holcus by e-mail (post@holcus.nl). We will give you detailed information about the costs of your specific order. Bicyclepasta tricolore is of course ideal for true bikers and cyclists events like touringtrips for cyclists, bicycle races and bicycle fairs. It is loved as gift and for a common meal for all the guests and visitors. And indeed bicyclepasta is the best you can have for dinner on a cycling holiday with the whole family; especially with small children.